A super secret squirrel event from Pink Kitten, to celebrate the holiday season! Join in and stay tuned for 12 days of special offers and competitions! All offers should be done online unless otherwise stated. 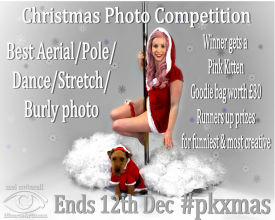 Best Stretch/Pole/Aerial/Dance photos with a Christmas theme wins a pink kitten goodie bag. You have until the 12th December. Post to Facebook christmas group/hashtag #pkxmas. Prizes for all round best photo, runner up prizes for most creative and funniest! 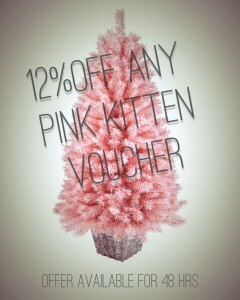 12% off any voucher. Book here. Discount available for 48 hours. 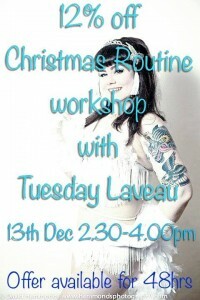 12% off our Christmas Routine workshop with Tuesday Laveau on the 13th December. Shimmy into the festive season in style. Buy one of our North Pole Dancer tops for just £7! Normally our Private lessons are £30 per hour, however for Day 6 of our Christmas Countdown we are offering 4 1hr Private lessons for just £100, saving you £20! Book here.